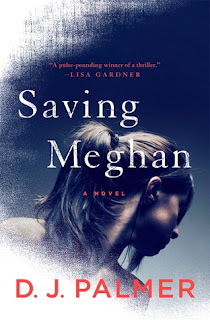 Saving Meghan by D.J. Palmer is a recommended domestic medical thriller. Becky Gerard is a devoted mother who only wants her only child, Meghan, to be well and healthy, but Meghan has been struggling with a mysterious, undiagnosed illness. Becky has learned the medical jargon and made personal connections with specialists while trying to help Meghan. Carl, Becky's husband and Meghan's father, doubts Becky's motives. He thinks she is obsessed and making Meghan ill by her treatment of her. When Becky meets with several new specialists she gets a new diagnosis for Meghan and a diagnosis for herself. While one specialist, Dr. Zach Fisher, believes Meghan has mitochondrial disease, another more powerful MD, Dr. Amanda Nash, believes Becky has Munchausen syndrome by proxy and maneuvers the situation for the state to take custody of Meghan. Now Becky is fighting for the life of her child and her reputation. The narrative is told through several different characters, including Becky, Meghan, and Zach, with Becky being the main narrator. Becky and Carl both are rude and unpleasant characters, although we are repeatedly told how darn attractive they are and how much this matters to everyone they encounter. Becky is such an annoying character - egotistical, privileged, and manipulative - that it is difficult to muster sympathy for her. It is clear, from the start, that Becky will be accused of Munchausen's. She is so unlikable that it is easy to believe except for snippets from Meghan's narrative which suggest something else is going on in her family. The writing is good, in spite of the unpleasant characters. This is a medical thriller that will pass the time if you simple overlook the traits of the characters and just follow the plot. There are some twists and surprises, however the pacing is a little slow at times. While there is a lot of medical jargon, it does serve to highlight Becky's obsession with Meghan's medical condition which helps to make Becky's diagnosis believable. This was a 3.5 for me, but I'm rounding down because the novel was a chore to read at certain junctures. A strong airplane book choice.